Botanical Description page for GingersRus plant database number " 3607 ". 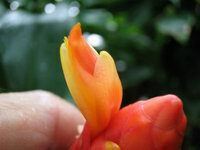 The photos shown on this page are from a plant that was identified as Costus scaber at the Smithsonian, USBRG#94-677 and from a plant received in horticulture as Costus spciatus. 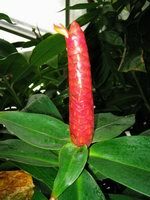 I have not dissected and fully examined the details yet, but it looks identical to the plant sold in horticulture as Costus spicatus. The calyx and bracteoles from both specimens are short and that along with the fact that the bracts are not green convince me that this (and others in the hort. 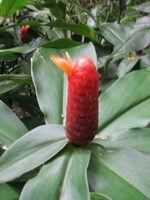 trade) are actually Costus scaber. Manual de Plantas de Costa Rica mentions that some plants from higher altitudes can be difficult to distinguish from C. wilsonii. 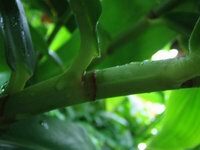 The difference is that C. wilsonii does not have a strigulose center vein on the upper side of the leaves, and it does have flowers with a "rayado" (spreading?) labellum. 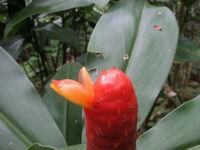 Also, mentiions some cultivated plants in the central valley of Costa Rica with greenish bracts and sometimes confused with Costus pictus. 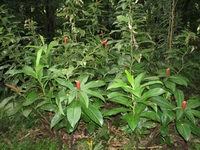 Some of the photos to the left of plants found in the higher altitudes along the trails near Cerro Brujo between Rancho Quemado and Drake in Costa Rica, may in fact be Costus wilsonii instead of Costus scaber. 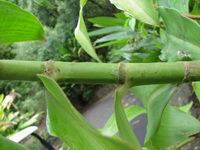 There were no flowers seen - only the bracts - but these were distinctively thin stemmed and they had the "rolled acumen" mentioned under Costus wilsonii. 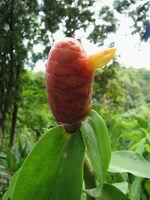 Costus wilsonii has not been reported on the Osa Peninsula. Inflorescence terminal on a leafy stem, elongating to 22 cm in fruit. Labellum 33-35 mm long, 25-28 mm wide, lateral lobes rolled inward forming a tube 5-10 mm diam.